Offering students programs throughout the world, SPU’s Study Abroad programs can include challenging coursework, community service, language study, field study, and more. The bounty of Italy — including prosciutto di Parma, Sangiovese grapes, heirloom tomatoes, and zucchini blossoms — offered delectable proof of sustainable food production for students in SPU’s new global seminar in Florence. 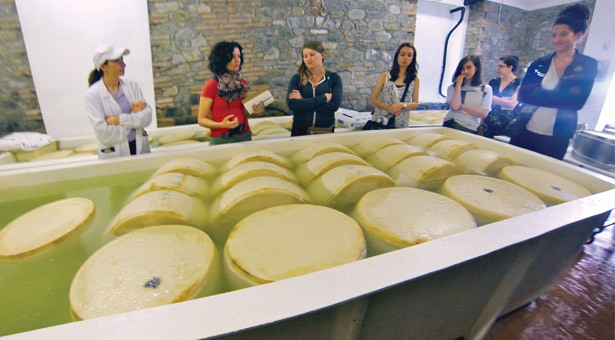 Associate Professor of Food and Nutrition Daniela Geleva (second from left) and her students tour a farm where Parmigiano-Reggiano cheese is being made. The nutty flavor is achieved through 20 days in a saltwater bath, followed by aging for about two years. When Margaret Johnson started working during high school, she began saving for a long-held dream: to study abroad in college. The new global seminar in Florence, Italy, focused on sustainable food production and the Mediterranean diet and lifestyle, caught her eye. Johnson and 14 other Seattle Pacific University students from various majors spent most of September soaking up la dolce vita in Florence, the cradle of the Renaissance. Italy is also birthplace of the international slow food movement, which strives to preserve traditional and regional cuisine. The one-month study abroad program was the culmination of more than three years of planning by Daniela Geleva, associate professor of food and nutrition. “I think for students to venture out to a new country and a new culture and to really get to know that culture through the lens of food is absolutely transforming,” she says of the program. The group lived in furnished apartments throughout the city center while studying at Florence University of the Arts. Weekdays were filled with classes, cooking workshops, Italian language study, and unforgettable excursions into the countryside of Tuscany and Emilia-Romagna to see and taste the tantalizing Mediterranean foods that have sustained Italians for centuries: Parmigiano-Reggiano cheese, wine, honey, prosciutto, balsamic vinegar, and more. On one of these field trips, the students visited a breeder of Chianina cows, an ancient Tuscan breed used for the famous bistecca alla fiorentina. Afterward, the breeder invited the group — 19 in all — into his home. Back in Seattle, Geleva is bringing the students’ understanding full circle with field trips to a local farm and a meat-and-cheese producer, getting them connected to food produced sustainably right here in the Northwest.